It’s easy to look at the overall team projections. Check them out. They’re right over there! (I’m pointing.) More than anything else, you care about wins, and, therefore, also losses. Team record is everything. Just about, anyway. Happiness is strongly correlated to your favorite team’s winning percentage. It takes more work to dive into projected team components. Earlier this very week, I did that to show that the Royals have moved away from the style they made so famous. I also did that to show that the Astros have suddenly become a contact-oriented offensive ballclub. It takes more work, and it’s also of lesser significance, you could say. Overall value is overall value, and components, by definition, are only a part. It makes perfect sense why most people don’t go beyond just the projected standings. Yet components are interesting, if only because we care about how teams will play. They can tell you who might win by slugging the crap out of the ball. They can tell you who might have a little advantage on the bases. They can tell you who might have a strikeout problem. And, defense? We can look at the defenses. Let’s do that right now! To start right off, defensive projections are pretty heavily regressed. So to put some numbers on the same scale, I’ve calculated z-scores. Instead of showing how many runs a defense is worth, I’m going to express defensive value by way of standard deviations. This lets me put 2016 and 2017 numbers side-by-side. It’s not perfect math, but it’s what you’re going to get. 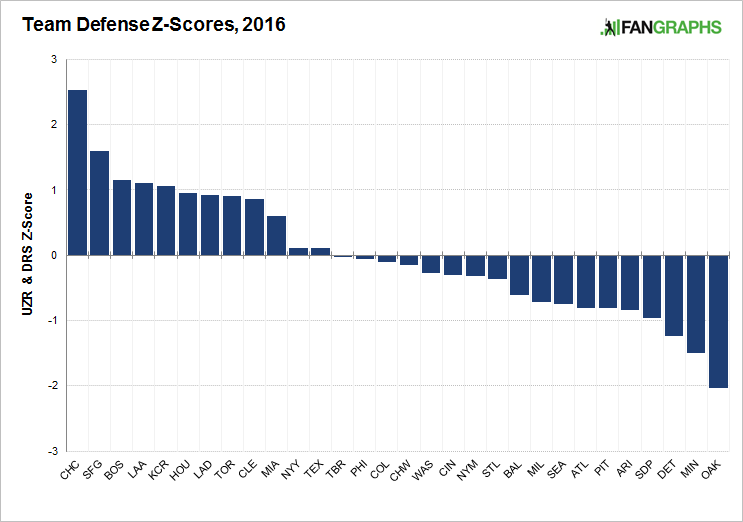 Here, first, is a plot of 2016 team defenses. This stuff, you already knew; I based it on an even blend of Defensive Runs Saved and Ultimate Zone Rating. The Cubs just stood out, in a positive way. Although it remains tricky to separate defensive performance from pitching performance, there’s an argument that the Cubs just fielded one of the best team defenses in at least recent history. The field became a batted-ball cemetery, which meant players increasingly had to be aware of tiny headstone obstacles. The Giants were also good. The Red Sox? Also good. The A’s? So very bad. Nobody cares about 2016 anymore. On, then, to 2017, which is — again — based on our projections and team-by-team depth charts. As is always the case, there’s room for you to disagree with certain projections, but they are all based on player histories, so the burden’s on you. Consider this, at least, a starting point. Surprise! The Cubs again. And, surprise! The A’s again. The Cubs still look great, and the A’s still look terrible, and the Royals look like they won’t miss Jarrod Dyson too much. The Angels, meanwhile, hope that their assortment of gloves helps to support a white-knuckle pitching staff. On the back side, along with the A’s, one finds some competitive hopefuls in the Mets, Pirates, and Nationals. It’s no secret the Mets have prioritized other components on the roster. The Pirates still have that Andrew McCutchen issue looming in the middle of the outfield. And with the Nationals, the bulk of the (projected) blame falls on Daniel Murphy and Jayson Werth. Murphy will probably hit enough that no one’s going to care. That’s the projected defensive landscape, at this point, but I think it’s at least as interesting to look at the biggest defensive improvements and declines. Which teams have moved the most? So here’s that, expressed as the difference between the two z-scores. Leading the way, we have the Mariners, who have replaced Nori Aoki with Jarrod Dyson, and Seth Smith with Mitch Haniger, and Ketel Marte with Jean Segura, and Franklin Gutierrez with Ben Gamel. This has been intentional on Jerry Dipoto’s part, as he’s tried to more fully turn over the defensively-compromised roster he inherited. Right on the Mariners’ heels, we have the Reds and the Rays. They’re the only other teams projected to improve by at least one standard deviation. The Reds are counting on a superior performance from Joey Votto, and they also get to go the whole year without Jay Bruce. Meanwhile, the Rays picked up Colby Rasmus, and shouldn’t have Brad Miller making mistakes at shortstop anymore. The Mets are looking at the biggest decline for now. The numbers aren’t quite buying Neil Walker’s step forward at second, and there’s also the whole outfield situation. Bruce is likely to be a liability. And the Astros are over there too, having invested in more bat-heavy players. Just as the Rays added Rasmus, the Astros lost Rasmus, and that’s a problem in this very specific regard. George Springer is likely to move up to a more challenging defensive position. This defense isn’t projected to be bad — more like average — but the group of position players will be better at producing runs than preventing them. As a final exercise, out of curiosity, I looked at the 390 team-seasons we have since 2003, the first year we have both DRS and UZR. 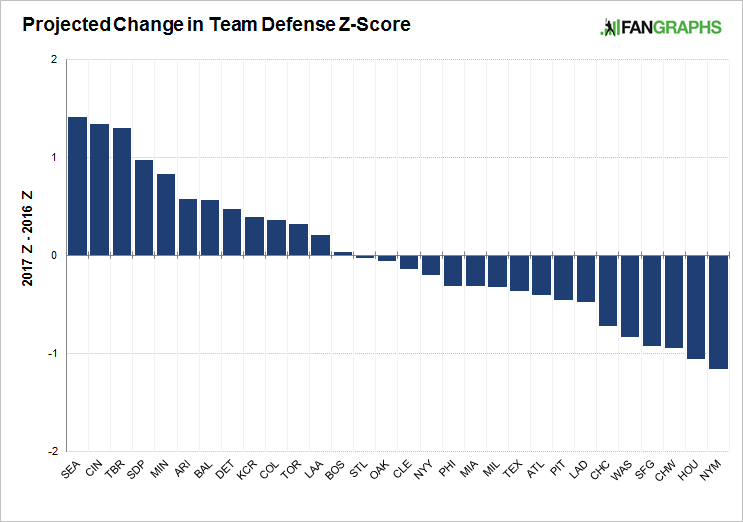 For every team-season, I calculated a defensive value, and then I examined how those defenses changed year-to-year. In the table below, numbers for the 50 teams with the biggest defensive improvements, and the 50 teams with the biggest defensive declines. The 50 teams with the biggest improvements got better by an average of 63 runs, as measured by the defensive statistics. Appropriately enough, the 50 teams with the biggest declines got worse by an average of 64 runs. Because it’s easy to question the validity of defensive statistics, it’s worth also looking at team pitching performances, and there we see the defensive performances reflected. The first group saw a seven-point improvement in adjusted ERA, with just a one-point improvement in adjusted FIP. The second group saw a 10-point decline in adjusted ERA, with just a one-point decline in adjusted FIP. The pitchers performed similarly year-to-year, but the run prevention flipped pretty dramatically. This is what the Mariners are hoping for, and for what the Mets are hoping to compensate. To what extent we can easily measure team defense in this era of players playing everywhere, I can’t tell you. I can tell you these are the numbers we have, and no one is making them up. There’s more than one way to win a baseball game, and you could say the the Mariners and the Mets have chosen some fairly different paths. We hoped you liked reading The Best and Worst Team Defenses by Jeff Sullivan! 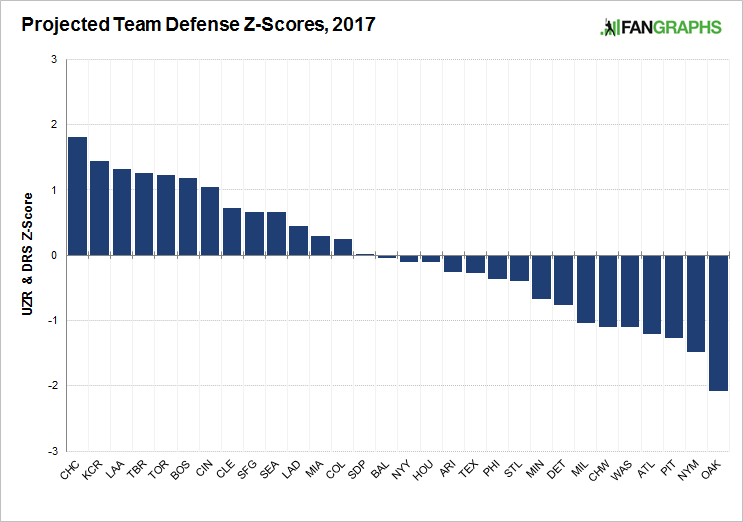 While the Cubs remain projected to have the #1 team defense, they are also projected to have the 6th largest decline in this area. Their 2017 lineup will be very similar to their 2016 lineup (no Fowler, no Ross as the biggest changes). Why such a steep drop? Just projected regression to the mean? Yep, that’s my guess. They were so, so good. I will disagree with this thought. From looking at baseball-reference.com Contreras has a better range factor than Ross had and threw out more base runners. Ross only caught Lester and Contreras will take a lot of games away from Montero. Montero is horrible defensively. Baez will probably play 2B more often than Zobrist and that is another huge upgrade. That leaves Zobrist moving into spots like of where he will be much better than Schwarber and much worse than Heyward. I know Baez and Zobrist will move around to spell players. Schwarber in LF will probably be a lower rated of-er than the Cubs had last year. In CF, Fowler had an up year with his range last year. Usually he is avg to bad in that position. Jay is under avg. and Almora is very good. So depending on playing time, will determine how this will pan out. I would imagine Jay gets to play against RHP and Almora against LHP. Rizzo and Russel are great and should be about the same. Bryant will probably not play much of this year and I would expect to get better on the “D” end as he ages. Just my take on this. 1 – Miguel Montero was 3rd by Stat Corner’s RAA and BP had him 8th by FRAA. To say he is horrible is just wrong. He was FIRST in MLB in called strikes above average (CSAA) in 2016. Just watch him–he is an awesome pitch framer. 2 – Bryant played LF the most of any Cubs player last year and was above average. Whatever the LF rotation is, subtracting Soler is most likely going to help defensive metrics. Mostly due to regression toward the mean, I’m sure.